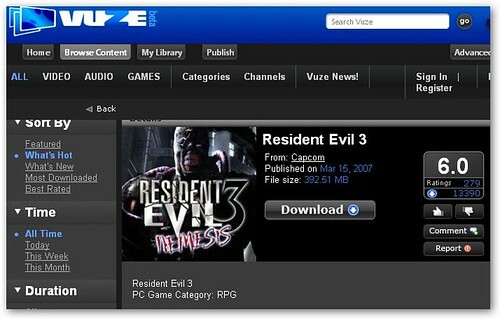 Vuze is a legal way to download high-definition video, music, and games using BitTorrent. 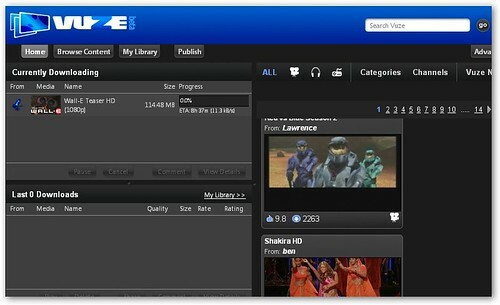 You might think of Vuze as a less technical version of the popular BitTorrent client Azureus. It's made for the mainstream. Unlike Joost and Babelgum, Vuze forgos flashy effects for a simple interface that resembles a web browser. It's more iTunes in style and effect. You have to actually download content to your computer to watch, listen, or play it. Since much of it is in HD, this can take a while. There's a limited selection of free content from partners like Showtime, BBC, A&E, and Revision3. However, the catch is that you can only keep it for 30 days. Free episodes of Penn & Teller, Coupling, Babar, and Brotherhood are interspersed with paid content like episodes of The L Word, games like Tomb Raider - Anniversary, and albums from artists like Cascada and Phil Collins. From the looks of it, Vuze is competing with the iTunes of the world--it's an entertainment retailer not an Internet TV play like Joost.